Waiting for the flop, you anxiously sneak a glance at your hand. You watch as the dealer glances around the table, ensuring that all bets have been placed. Tension mounts as the final card is revealed. It's that King you were hoping for. A flush, for the win! Reaching out for the pile of chips you suddenly remember that you're not actually at a table. Rather than a casino, you find yourself in the comfy confines of your home. It's all a virtual, online casino. Live streams of real dealers have enveloped you in the action. However, in order for a live streaming gambling app to be fully immersive, it needs to feel natural. A big part of that is the latency. There can't be a long delay between when the cards are dealt and when the players will see them and place their bets. Furthermore, if there is a combined game where you have a table with both online and in-person players, the latency needs to be short enough so that experience can be responsive as needed. Now that Flash is obsolete, WebRTC is a great way to accomplish a natural live streaming experience. Our WebRTC integration allows for real-time latency of around 500ms. Best of all, our integrated HTML5 SDK allows you to build a webapp so that users can access your platform on any browser on any device. Since native gambling apps will be blocked by their respective app stores, browser-based applications remain the only option. Let us not forget the security. While online gambling removes the need for physical money (although I do miss parading in with my suitcase full of hundreds), ensuring that the connection stays private is still very important. WebRTC encrypts all streams by default thus hiding the stream from hackers, and our user authentication plugin ensures that only authorized users can log in and join streams. We don't want other players screen-watching! Of course, a well-designed app usually means an increase in users. As such, the app should be built to allow for scalability. The Red5 Pro autoscaling solution enables for large scale applications to stream out to hundreds of thousands of users. Importantly, all those users will still be getting the same real-time latency so the user experience will not suffer. If you are a developer with a ton of time on your hands, then you can also check out the open source Kurento. Without a lot of custom work, it won't really handle a large scale but with major amounts of coding, you can create a functional live streaming app. Additionally, online gambling offers great opportunities for the development for even more realistic experiences. In fact, investment in VR Gambling Industry boasts a growth prognosis of at least 800% by 2021. 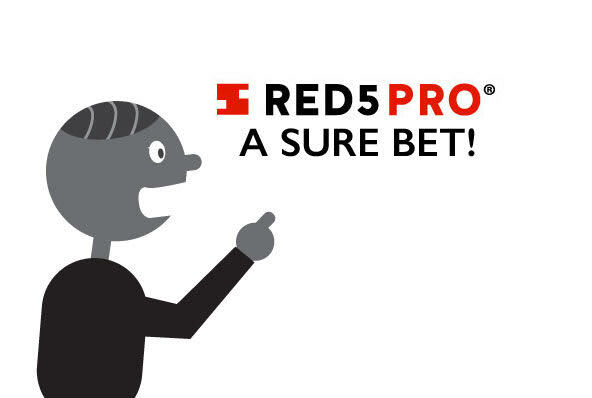 Since Red5 Pro was built to allow for the creation of a variety of live streaming apps, this makes it a perfect choice for building out new technology. Find out more about what Red5 Pro can do for you by sending an email to info@red5pro.com or scheduling a call to talk with us directly.